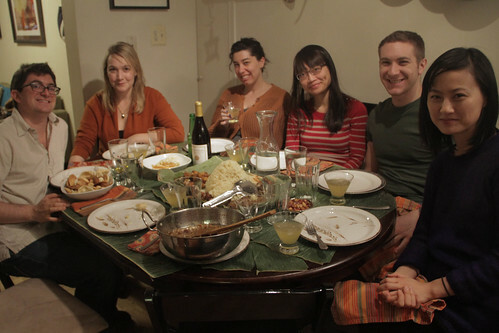 Joining us for the meal were Erika, Claire, Iris, Ben, and Michelle. Indonesia's best-known liquor was actually a lot better known a century ago. In that pre-Prohibition age of punches, this sugarcane-and-rice firewater clocking in at 50% alcohol was a mainstay, a touch of the colonial and exotic. As a predominantly Muslim country, Indonesia has little drinking culture (Bali is a notable exclusion! 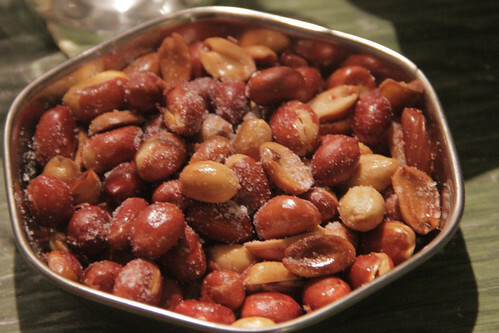 ), but this recipe, with limes and freshly grated nutmeg (which is native to Indonesia), seemed appropriate. Laura made them cold and strong — there's nothing but ice, simple syrup, and lime juice to cut the alcohol! The tumpeng is more than a cone of rice representing the country's mountainous terrain. It's the sign of a celebration, as important to many Indonesian families as a cake is to a Western birthday. It's also more than just the rice itself, because it always comes with an assortment of foods that make up a feast, at the whim of the host. It's this intersection of tradition, symbolism and flexibility that's led it to recently be named the primary national dish by a government agency. This recipe looked great, but turned out not so good. Soaking with fresh turmeric overnight didn't make it as richly yellow as a quick douse of the powdered version would have, and the instructions to boil, covered, on high for 20 minutes led to burnt rice sticking to the sides so hard it took a week of soaking to get off. Fortunately, though, most of the rice turned out well, and as you can see, made for a pretty cone — which I formed with a chinois, a pointy strainer. These things start out as these little wafers of sun-dried tapioca starch with flavoring, but as soon as they hit oil, they puff up, with a texture somewhere between a Cheeto and meringue. You can buy them pre-fried in a bag just like chips, but it's so fun and easy to make them. You can even make them completely from scratch, but alas, without much sunshine to speak of, I resorted for store-bought. I made two versions: garlic, and fish, the latter being not a wafer but more like a nest of noodles. 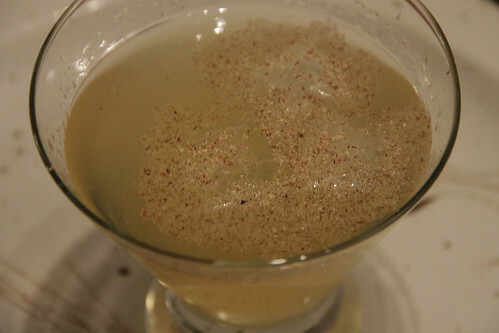 The savory-fatty-crispy contrasted the strong, sweet punch quite nicely. I couldn't have been happier to fire up the grill for the first time this year for this tasty treat, popular throughout Indonesia and Southeast Asia. 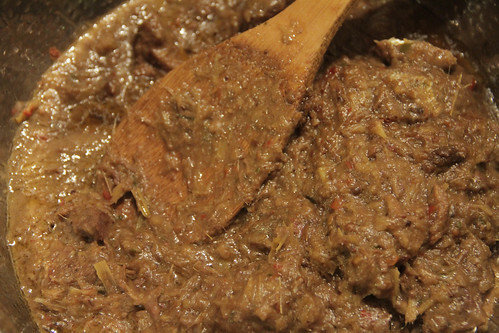 You start by making a peanut sauce, a complex thing of beauty, with peanuts fresh roasted on the stove, blended with intense flavors like shrimp paste and cayenne peppers. Then skewered chicken goes through two marinades: first a bath in sweet soy sauce and chicken fat rendered with garlic and ginger (YUM), then halfway through cooking a basting with peanut sauce, more sweet soy sauce, and lime — all that fat and sugar make for some flare-ups, and it was dark and cold out so it was hard to test for doneness, so I just cooked it low and slow until crispy. 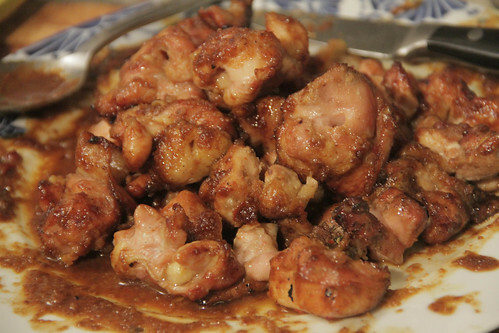 My only regret through the whole thing is that I didn't buy more chicken; the tasty, mildly sweet, caramelized morsels disappeared in seconds. For whatever reason (sanitation? 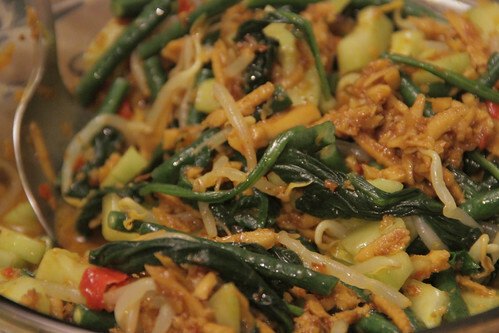 ), Indonesian cuisine has many cooked salads. Vegetables I'd be happy to eat raw, like bean sprouts, are blanched or steamed before being dressed. While gado-gado, with a peanut dressing, is probably the most famous, we have plenty of peanuts going on in other dishes. An urap, with a sweet-sour-spicy flavored coconut dressing, is more common on a tumpeng platter.While I enjoyed the flavors dressing, the blanched veggies weren't quite my thing, though some others at the table said they liked the whole thing quite a bit. By the way, this was by far my easiest coconut-extracting experience. I did my usual thing of whacking on the equator a few times with the back of a cleaver, and not only did it crack nicely and easily to open, but the flesh also separated almost effortlessly from the shell. Usually it takes a good ten to twenty minutes to pry it off. Did I do something right? Did I get lucky with this coconut? I'd love to understand what happened so I can repeat the success. 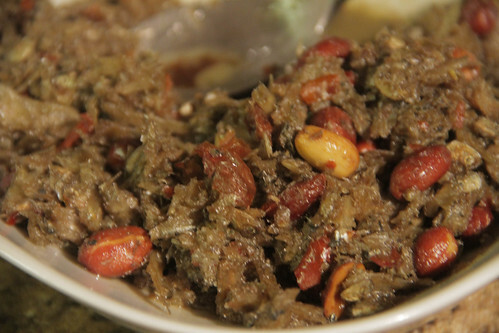 The Minangkabau people of West Sumatra, who have a centuries-long tradition of travel and trade, invented the dish for their journeys, and then spread the love wherever they landed, so now it's a popular dish throughout the region. Today, with decent refrigeration, packaging, and supply chains, there's no need to spend long hours making this complex dish, except that it happens to be extremely tasty — kaffir lime leaves, star anise, lemongrass, and a host of chilies and aromatic roots combine for a really luscious dish. The beef, which starts out as an extremely tough cut like shank, melts into nothing until it's the texture of tuna fish. And all that coconut milk — the fat makes the dish rich, and the residual sugars caramelize! Yum. 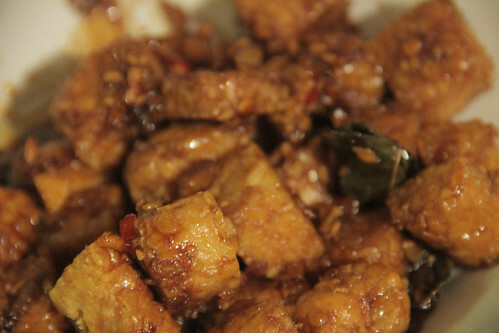 Tempeh is Indonesia's homegrown soy product, based on fermentation with a particular fungal spore whose white vegetation forms a white mass that holds the beans together. (If that sounds gross to you, I recommend you not research how cheese is made.) 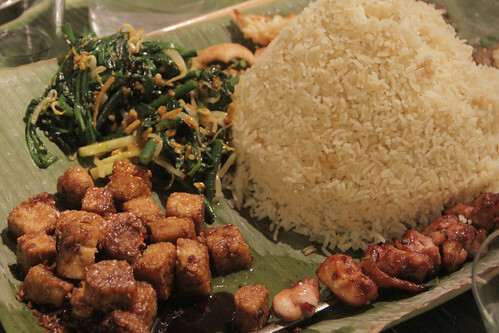 While in the West we tend to use it as a vegan substitute for ground beef, Indonesians tend to treat it as the Chinese often do tofu, cut into cubes and stir-fried until crispy. This recipe uses a straightforward sambal of quick-cooked garlic, shallots, chilies and galangal, made into a thick sauce with palm sugar and kecap manis, a sweet soy sauce. (Kecap is pronounced pretty much like "ketchup," and that's no coincidence — it's a long history, but our tangy, thick tomato condiment can trace its history back to Southeast Asia.) The result is quite tasty, with moderate spice, and very healthy for vegetarians and vegans as it's loaded with B vitamins. This dish is about as intense as it sounds: super-fishy, crunchy, and with that sweet-sour-spicy base we've seen repeated a lot throughout the meal. It was a bit of work to soak and then dry the anchovies, but I'm glad I did because otherwise they'd have been way too salty. Fun to munch on, but you don't need to make much per person unless you need something to snack on with beer. 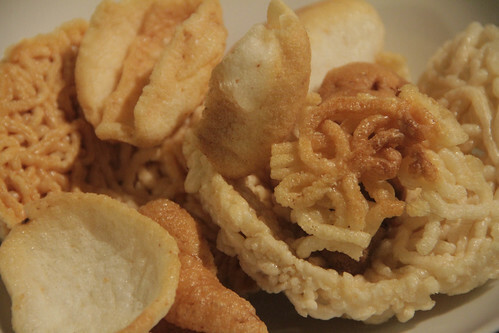 Whether warm or icy, most Indonesian desserts are a sort of half-drink, half-soup full of assorted nuggets. 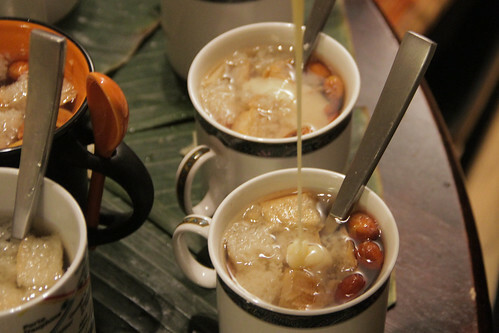 This one is a wintertime comfort, a sweet ginger broth playing host to a grab bag of delights both floating (bread, peanuts) and sinking (tapioca pearls, palm fruit), topped off with a drizzle of condensed milk because why not. It's a bizarre texture combo, ranging from fall-apart mushy to chewy to crunchy, but I found it surprisingly nice and comforting on a cold evening.